Scientists from RUDN University have synthesized a number of new cytotoxic substances that can damage cells. The results of the study could be used in cancer therapy. The compounds were obtained by domino reaction, a successive formation of several new chemical bonds. The study was published in Synthesis. 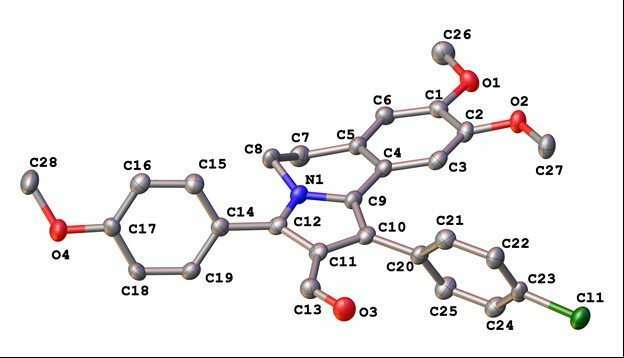 In search of a cure for cancer, scientists are looking for new ways to synthesize compounds similar to natural alkaloids—organic substances of plant or marine origin containing a nitrogen atom. Alkaloids of the lamellarin group, substances derived from Lamellaria mollusks, are known to have cytotoxic and immunomodulatory (immune-regulating) activity as well as anti-inflammatory properties. Lamellarin compounds are of great interest to scientists seeking substances with high anticancer activity. One of the methods for synthesizing new organic compounds is the domino reaction, a process in which several new bonds are formed successively, just like dominoes falling one after another. The initial stage of synthesis is crucial. The first stage of the reaction is nucleophilic addition. During this reaction, the molecule is affected by a nucleophilic reagent, or nucleophile. Such reagents generally include particles (anions or molecules) with an unshared electron pair at an external electronic level (as, for example, in OH-, Cl-, Br- and water molecules). Scientists used the nucleophilic addition reaction for α, β-unsaturated compounds containing not only single carbon-carbon bonds, but also double bonds. In α, β-unsaturated compounds, the second and the third carbon atoms have a double bond. This process is known as Michael's addition. Domino reactions involved 1-aroyl-3,4-dihydroisoquinolines and aldehydes with a multiple bond. As a result, there was a consecutive generation of several intermediate substances—the intermediates. During the domino reaction, RUDN University chemists were able to obtain a number of pyrrolo[2,1-α]isoquinolines with an aldehyde functional group in just one step. The resulting compounds showed cytotoxic activity in a number of tumor cells (lung carcinoma cells, intestinal carcinomas, cervical adenocarcinomas and sarcoma cells) during primary bioscreening. The bioscreening was carried out by scientists from the Institute of Physiologically Active Compounds (IPAC), RAS. "The fragment of 5,6-dihydropyrrolo[2,1-α]isoquinoline is the core for such alkaloids as cryptaustoline and cryptowoline (derived from algae), as well as lamellarins," said co-author Maria Matveeva, a postgraduate student in the Department of Organic Chemistry at RUDN University. "Further research will be aimed at modifying the compounds obtained in order to increase their anticancer activity."